The power of crowdfunding is undeniable. The media is full of stories of companies raising large amounts of money in just a few days, hours or even seconds! Looking at these examples you might be forgiven for thinking that crowdfunding is easy. Let me tell you, it’s not! Crowdfunding is like running a marathon. It takes months of preparation, a good dose of persistence and a degree of stubbornness that stops you giving up even when the going gets tough. Most of the hard work for a successful crowdfunding campaign is done before you put your campaign live. As with marathon running, the amount of preparation you do is directly correlated to the result you achieve. There’s a lot to do: From preparing written copy and a video pitch to developing a motivating suite of rewards or business valuation. You’ll need to hone your business or project plan in order that it conveys the essential information investors look for, and you’ll need to tee up potential investors so that the money starts to pour in when your crowdfunding pitch goes live. In fact, crowdfunding is a full-time job – one that’s usually done alongside your other full-time job – that of running your business or project. Crowdfunding is not an exact science either. Are you certain the crowdfunding platform you have selected will help you attract the right type of investors? Have you pitched your rewards package at the right level to motivate investors? Would it be better to set a lower crowdfunding target and overfund, or should you aim high from the start? For many, crowdfunding seems appealing but when you look into the detail of what is needed, crowdfunding moves to the “too hard” pile and the campaign never gets off the ground. For those that do try, there are many pitfalls and difficulties along the way. The bad news is that over 50% of crowdfunding campaigns that launch fail to achieve their target. For this reason, it pays to get professional help. After all, if you do run a marathon chances are you will take on a personal trainer or, at very least, research and adopt a training programme. 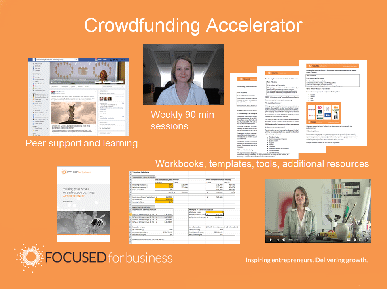 Crowdfunding Accelerator, an online programme of workshops and mentoring, is designed to make it quicker and easier to run a successful crowdfunding campaign. Over 8 weeks, in 90 minute (online) weekly meetings you are guided, step-by-step, through the elements of a successful crowdfunding pitch. There is specially created content which focuses your effort on the things that really matter, workbooks, easy-to-use templates, helpful tips and motivational advice. It’s like having a personal trainer at your side. There is no doubt that, if you prepare properly, crowdfunding is a good source of finance. In fact, just as a marathon runner can pretty much tell you the time they will run on race day, so it is with crowdfunding. If you prepare properly you’ll know just how quickly you’ll achieve your crowdfunding target , perhaps down to the last second! book onto a free online taster session. Sign-up here to receive details of the next taster session.